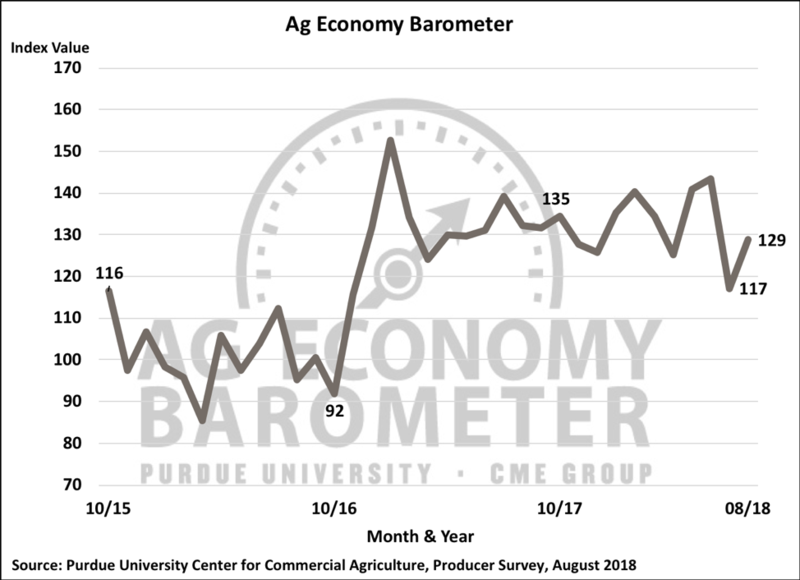 The Ag Economy Barometer rebounded in August to a reading of 129 after falling to 117 in July. However, producer sentiment remains well below its late spring readings of 141 in May and 143 in June. Organizers say the shift occurred primarily because producer’s perception of current conditions improved as the Index of Current Conditions increased to a reading of 121 following a dip to 99 in July. The Index of Future Expectations also rose in August to 132 just six points above its July reading. The shift occurred as the Department of Agriculture announced intentions to aid farmers hurt by the administration’s trade policies. However, farmers were still concerned about a trade war, but they were somewhat less concerned in August than they were in July. In August, 51 percent of respondents thought a trade war was likely to reduce U.S. ag exports, down from 54 percent in July. Finally, the percentage of farmers that feel trade conflicts will reduce their farm’s net income, 71 percent, was virtually unchanged in August from July.